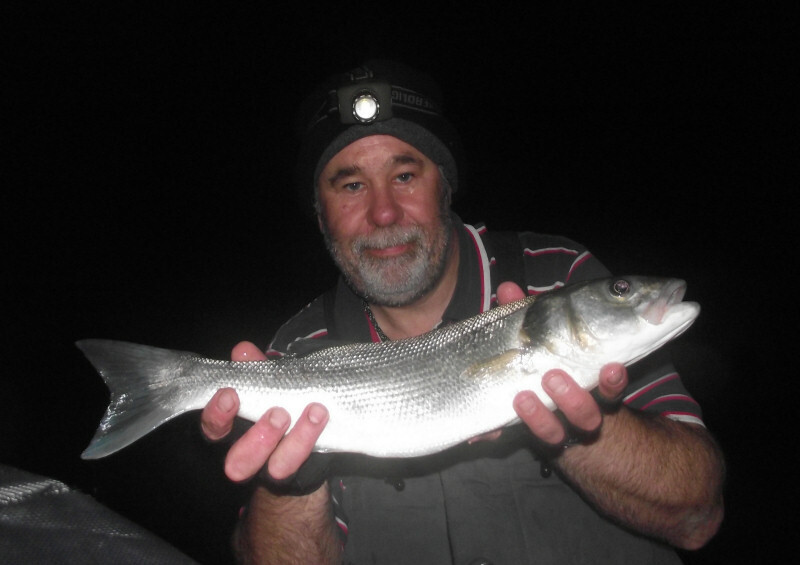 Although the recent South Westerlies have subsided and the seas have calmed considerably, I thought I’d go anyway and have a bassing and scratching session last night. 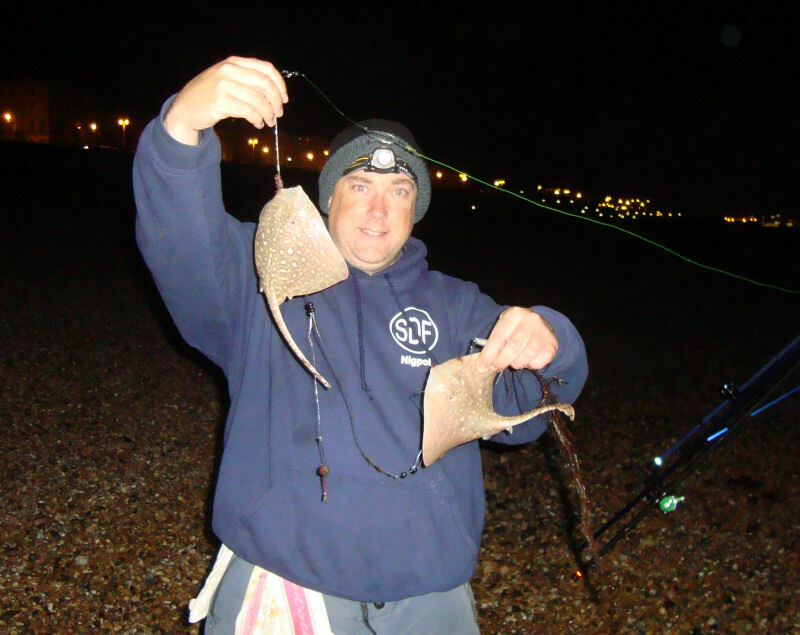 Armed with a couple of boxes of squid and some ragworm, I headed over to Seaford Beach. I arrived at about 8pm – an hour or so before low water and found a calm sea with a few gentle breaking waves to stir things up, virtually no wind, just a light breeze and a slightly overcast sky. To start with, I set up the scratching rod with a size 4, two hook flapper baited with the worm and sent that out. I planned to start with the bass rod just after low water and into the dusk, so I set it up in readiness with a long link running ledger with a 5/0 pennel. It wasn’t long before the scratcher showed signs of activity and the first retrieve brought in a double shot of a small dab and a micro smooth hound. I re-cast and within seconds, it was on the go again, only this time, it was small school bass of about a pound. In the following hour or so, I had another four similar sized bass and another dab. At about 9.30, I deployed the bass rod, just lobbing the bait beyond what breaking waves there were. I kept the scratcher out as well, which brought in a few small pout to add to the tally. Bang on the stroke of 11pm was when the squid was hit hard, hooping the rod over and after a spirited little fight, a plump bass was on the shingle. It went around 2½lbs and 46cm. A quick re-bait and cast and just in time to see the scratcher rod tip pull down which resulted in a small thornback ray hitting the beach. At this point, I decided to abandon the scratcher and concentrate on the bass rod. After packing the rod away, I saw that there was a huge slack line on the bass rod and after a frantic wind in, another bass of about a pound was on the beach. Half an hour later, the bass rod trembled in my hand and then the tip slammed down hard and the fish shot off to the right, then out before spitting the bait, leaving the squid in tatters. Another good bite was missed, some twenty minutes later while distracted with my coffee. 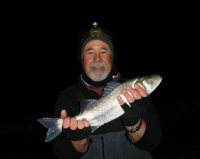 1.15am and just over four hours into the flood tide there was a repeated tapping on the rod tip before a good pull down and it was another fish on. There wasn’t so much spirit in this one just some dogged tugging and dead weight – until it was on the shoreline, when it took off a bit before being gently slid up the shingle. A better fish this one at 54cm and 4lbs on the nose. Re-bait, re-cast and re-coffee while awaiting the next one – hopefully. By now, it was actually quite warm and a really pleasant night to be out. The sea had flattened out even more and I wasn’t expecting much else to happen, when suddenly, bang! The rod tip went over and another fish was on but as quick as it came, it went, leaving another shredded squid. 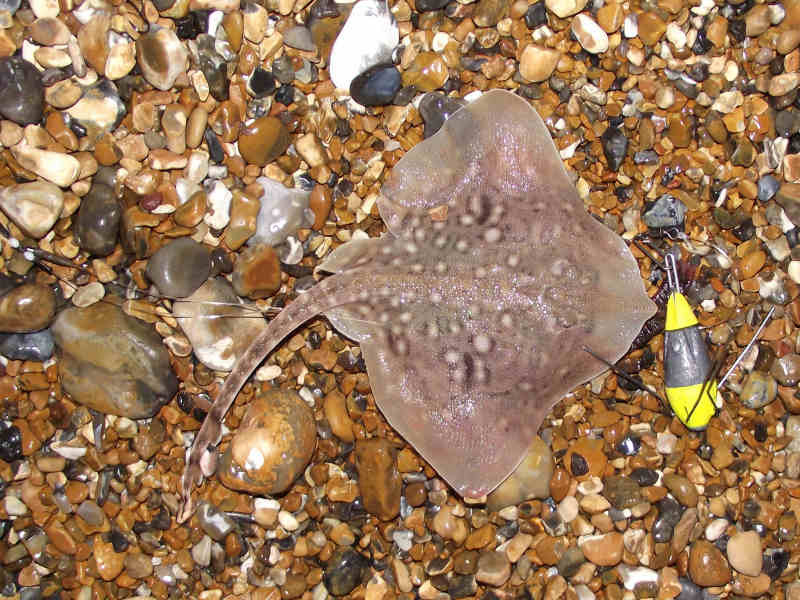 With about half an hour to go before high water, thoughts of packing up were in my mind, when out of the blue I had another take and shortly after, a three pounder emerged out of the wavelets and onto the beach. The last squid was impaled on the hooks and lobbed out, where it remained untouched until it was time to go. This turned out to be quite a night – especially when I hadn’t expected so much action. Just goes to show that sometimes, fish don’t always conform to the predictions on times, states of tide and weather. The next trips to this beach will be purely bass in an attempt to get that allusive ‘double’. It’s there and it’s waiting. 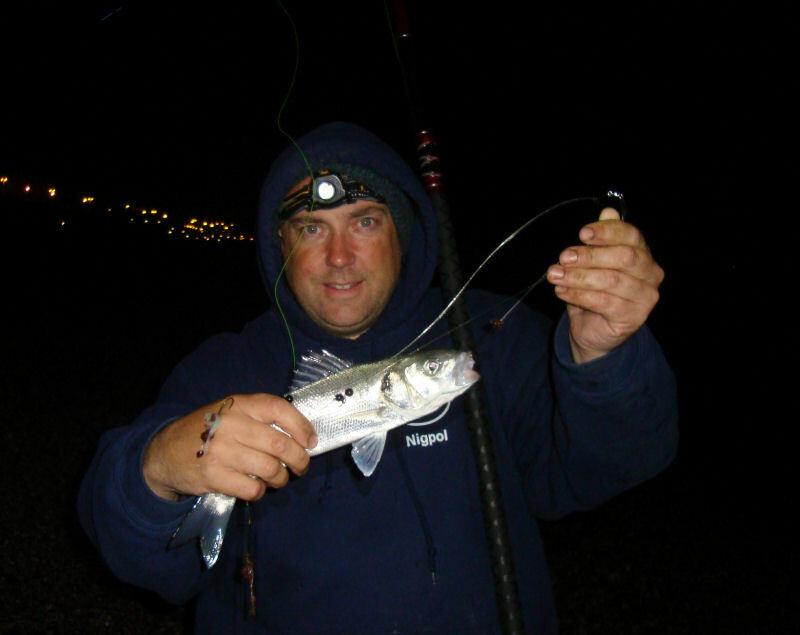 I haven’t had a session down at Brighton Marina for a while, so I thought I’d take advantage of the fine weather and calm seas yesterday evening to have a crack at some bassing with in-close big mackerel baits, plus a bit of general scratching with worm baits. I arrived on the East arm at around 7pm and walked out to a free space at bay 36. Conditions were no wind, a flat calm sea and a bright sun. The plan was to snag out a few mackerel on feathers for bait, before fishing in earnest – only one problem – the mackerel decided they weren’t going to play and despite my best efforts, there were to be none. On to plan B then – use the worm to get a few pout for bait (more on that later). A couple of fishing pals, Jonah Danny and Mike joined me not long afterwards, which I should have known would be the kiss of death. They had planned ahead though and brought some ‘bait’ with them in the form of ‘orrible, minging, poisonous mush; otherwise known as supermarket ‘fresh’ mackerel. Honestly, I’ve seen better conditioned fish in the bottom of a bin that’s been run over and set alight. Not being able to get any proper fresh mackerel and with no signs of them even being in the same sea as us, I baited my feathers with small sections of worm and dropped it over the side to temp some small pout. 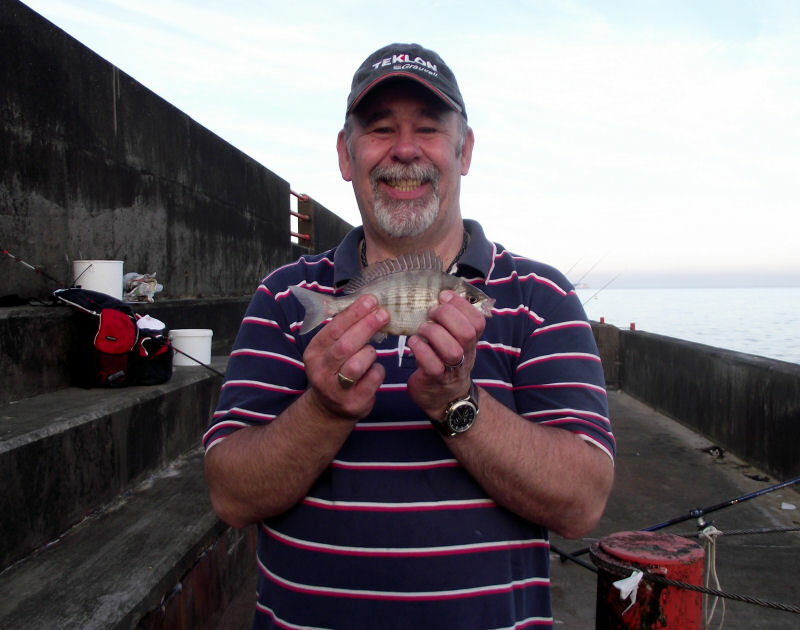 In this exercise, I only managed to catch small bream (Pictured) and for the life of me, I could not get a pout – silly really as normally they are a bloody bait robbing nuisance. Anyway, at least the bream was another one on my species list for the year. In the meantime, my other rod had been setup with a size 4 two hook sole rig (hoping for a sole once darkness fell) baited with worm and lobbed out – maybe I could get a pout on that. Even that didn’t work, as the first fish on that rig was a small thornback ray, followed by another small bream – it wasn’t looking good on the bass bait front. 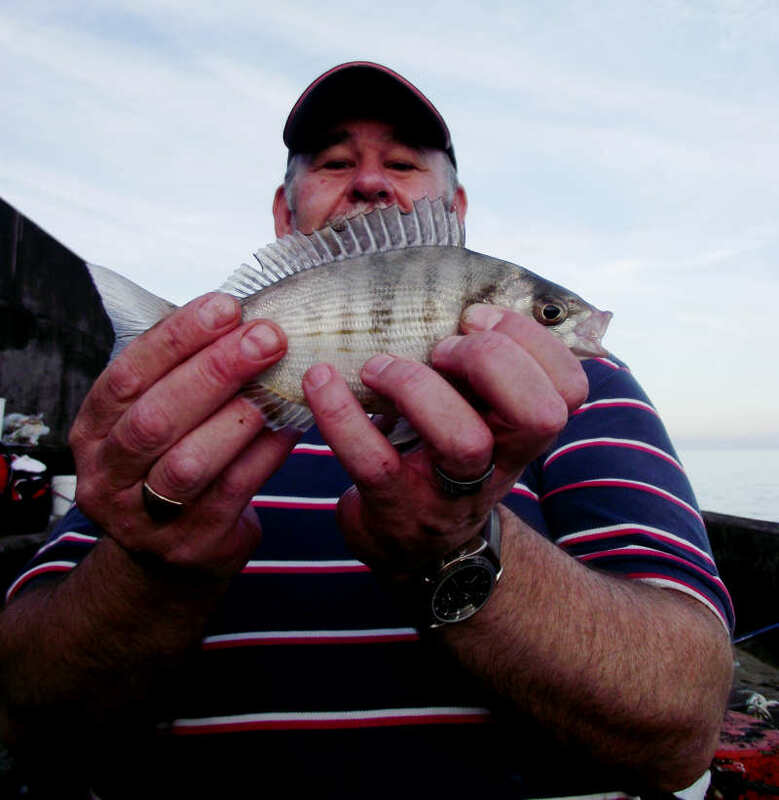 The second picture isn’t another bream – it’s the same as the first but artistically photographed by Danny to make it look bigger (I don’t think it worked). I later managed more bream, another small ray and a small flounder but I reckon the pout had hitched a lift with the mackerel and gone to wherever they went. So then, while I was busy breaming, the boys were busy blanking with their poisonous offerings. They packed up around midnight (lightweights) to head off home. Kindly (I think), they left me with a bag containing the remains of their toxic and by now dried out yet still slimy fish offal. Having examined it in the style of CSI Grissom and deciding not to bait up with it, I put paid to my chances of catching anything decent by lobbing the bag of offending shite over the side (not the bag though, obviously). 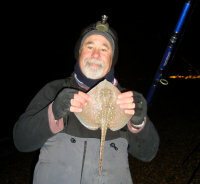 I stuck it until just after the 2.30am high water but only managed another couple of bream in that time. Although the target species (all three) weren’t forthcoming, it was a lovely evening to be out and with some good company, a great time was had. Yesterday evening, after work, I met up with a Nigel, a guy visiting from sunny Devon and a member of another site I visit – South Devon Fishing. We had initially planned to fish Brighton Marina but the wind conditions at the time put paid to that, so to plan B, we decided to fish Brighton beach, just West of the Banjo Groyne. We got onto the deserted beach at about 8.30 pm to a brisk South Westerly breeze and a nice lumpy, coloured sea, lovely looking conditions for bassing. I setup the bass rod with a long link running ledger ending in a 4/0 pennel baited with launce to start with. After the first cast, it became apparent that weed could be a problem, as it was soon clogging up the line and tackle and I ended up having to bring in the baits at frequent intervals to clear the line. Nigel had setup his rods with flappers and vaious combinations of baits and was soon in the water. 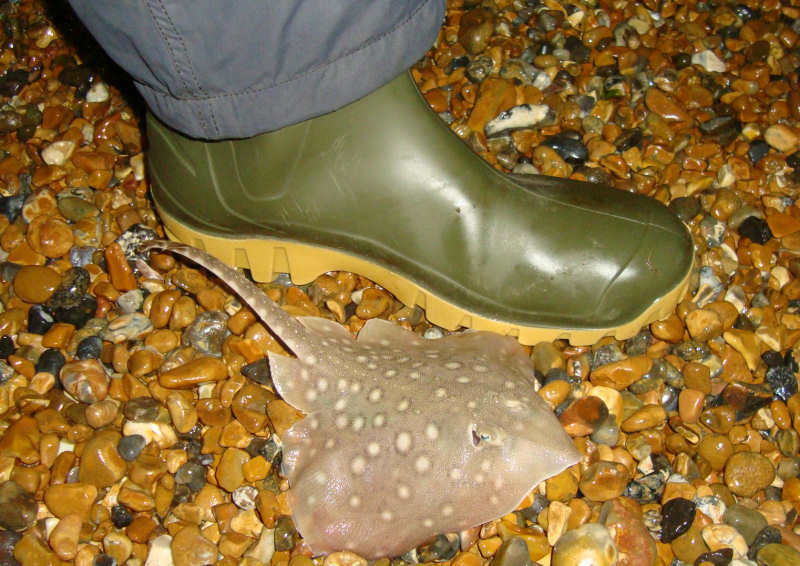 Nigel was first in with the fish when he landed a small thornback – and no matter what he tries to tell anyone, that is not a size 47 wellie, it is my rather demure and delicate size 11! I do like these little rays but they can be a pest at times and I do wish we got them in the larger size off the shore around here. I had just re-baited the bass rod with squid and cast out and was in the process of tackling up my second rod, when I heard the ratchet on my reel go briefly and thought it was another clump of weed pulling line off in the waves, so let it go. It then went again and I noticed my line was way off to the left – big weed! It wasn’t until I started to retrieve that I could feel the definite kick of a fish on the other end. 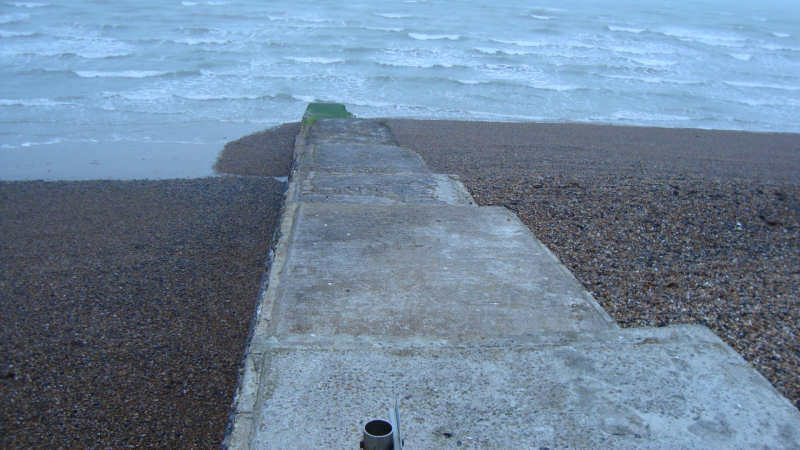 I carefully brought it in through the waves and up onto the shingle where I found a lovely small bass of a measured 47cm and around 2½lbs. A nice and promising start to the evening, just needed to get its big brother now. By now, the wind had started to drop and thankfully, the drizzle had also stopped, for which I was eternally grateful as my lovely neck warmer was somewhat damp and it was beginning to feel more like a wet cat around my neck – or what I imagine a wet cat around my neck would feel like. Nigel was soon in again with another small thornie. He had told me that he had spent six? sessions in his native homeland trying for a thornie and had finally managed his quest. He then comes up here and they come along like buses. I know, I know they’re small and I hear you say that they’re not real thornies but it’s all we can manage in these ray deprived parts. 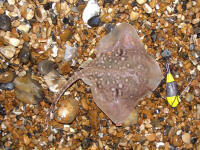 Anyway, he then started to show off his ray catching prowess by landing a double shot of the little critters. Honestly, there was no way of stopping the guy. I thought I was going to spend the entire night taking pictures of the damn things. As the tide pushed up, the wind dropped completely and as a result, the sea flattened out completely with virtually no wave action. The good thing though, was that the weed had gone and gear was coming back clean. Bites also dried up and it seemed like the fish had gone too. Launce wasn’t working and neither was the squid or crab; varying distances made no impact either. I heard a shout go up from the thornie king and saw him walk back from the waters edge clutching a fish – and it wasn’t a thornie! He’d got his own bass, although somewhat smaller than mine A quick photo and off it went back into the oggin. With nothing doing, I was thinking about packing up but as usual, I can never resist that ‘last cast’ and so carried on, even though my optimism levels had dropped to those of a Christmas turkey – but as they say ‘you just never know’. As I stood there pondering what to do, I saw a rod tip dip down – the one at distance baited with crab. I waited and it dipped again and I lifted into what felt like heavy resistance with a bit of a kick. Another thornie maybe? Anyway I dragged it into the shallows and saw a flounder – must have been a greedy bugger to take whole crab on a 3/0 I thought. It was then that I saw there was another line tangled in there, which turned out to be one of Nigel’s previously lost flapper rigs -and it one of these hooks that was in the flounder. We’ll call that one a joint effort I think. With the tide dropping quickly and at about 3.15 we decided to jack it in for the night and head back. It wasn’t the busiest of sessions but at least there were fish and it was a great time in great company. I’m hopeful of a re-match at some time in the summer when I’ll be heading off down Devon way. 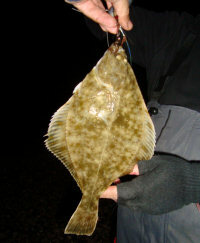 Just a quick report: Fished the East arm of Brighton Marina yesterday from 6pm through until about 2.30am. Bay 32 to start with then a short move to 36 a bit later. No wind. Flat calm, clear sea. No weed to speak of. Was especially interested in fishing the low water (10.30 approx) period for bass. Fished mackerel head on a long link running ledger for bass and used lugworm on a size 4 two hook flapper as a scratching rig. Could only get one wrap of lug so used very small pieces to make it last longer. As it happened, it ran out very quickly and resorted to small pieces of mackerel instead. Final result was: Two small schoolie bass, one small bream, loads of Pout and one small Red Mullet falling to lugworm and a small thornback ray and a scad on the mackerel. I did feather for some fresh mackerel at dusk but only managed one. Nothing at all on the bass rod, even live baited with the Pout but nothing interested in it. Disappointed at not getting anything decent – especially on the bass front but it was a decent evening out.